Today is Saturday, June 25th and it has been a very good day. 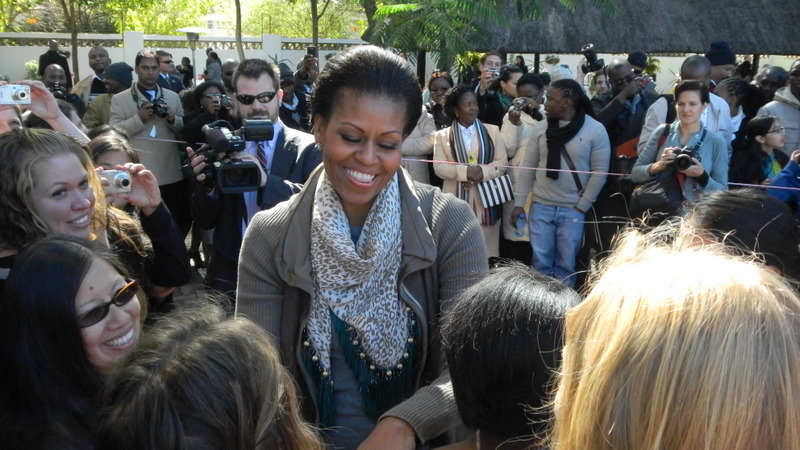 We had been invited to be part of a contingent of Peace Corps Volunteers to meet the First Lady, Michelle Obama during her visit to Botswana. 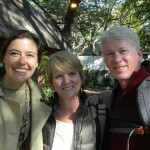 The meeting was to be today at the residence of the new US Ambassador to Botswana, Michelle Gavin. The previous ambassador, Stephen Nolan, just finished his term as Ambassador and returned to Washington. 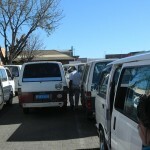 Getting around in Botswana is a hassle. We caught a ride to Gabs with the Stepping Stones bus. 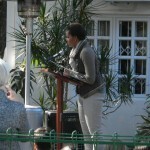 They were on the way to the Grand Palm Hotel in Gabs where the First Lady was staying. Kids from Stepping Stones had been invited to come to the hotel lobby to sell some home made jewelry as an income generating project. 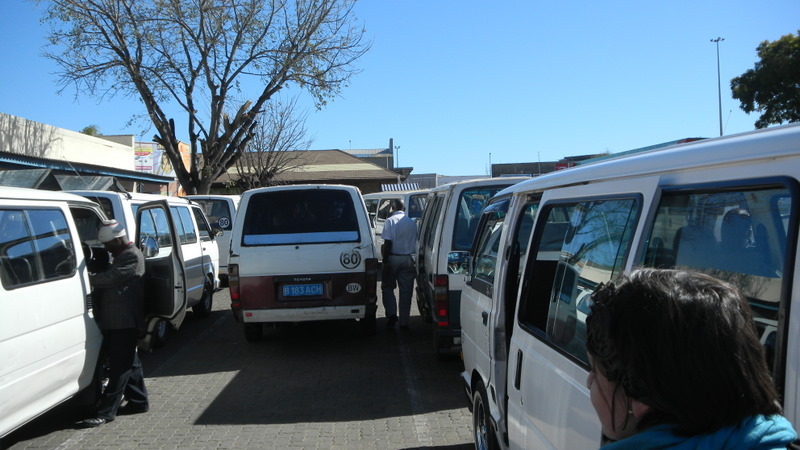 We got off the bus at a combi stop near the hotel and went to the bus rank. From the bus rank we walked about ½ mile to “the other side” and caught another combi to a stop near the Ambassador’s residence, and then walked the last two blocks. On the final combi we joined up with a few other volunteers we knew and went the rest of the way with them. Security was tight as you might expect, it was similar to the airport security checkpoint, but there were differences. You could keep your belt and shoes on; the personnel were secret service, not TSA; and everyone was polite. 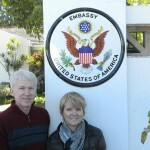 Once through the security gauntlet we entered the grounds of the Ambassador’s residence which were beautiful. There was a huge backyard that was landscaped tastefully with a large wall around it. There was a speaker’s platform set up near the house and rope set up to indicate where the First Lady would be addressing us. There were a few hundred people milling around. 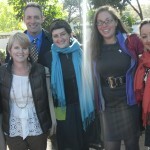 Most of the people we did not know and were probably embassy personnel and family. 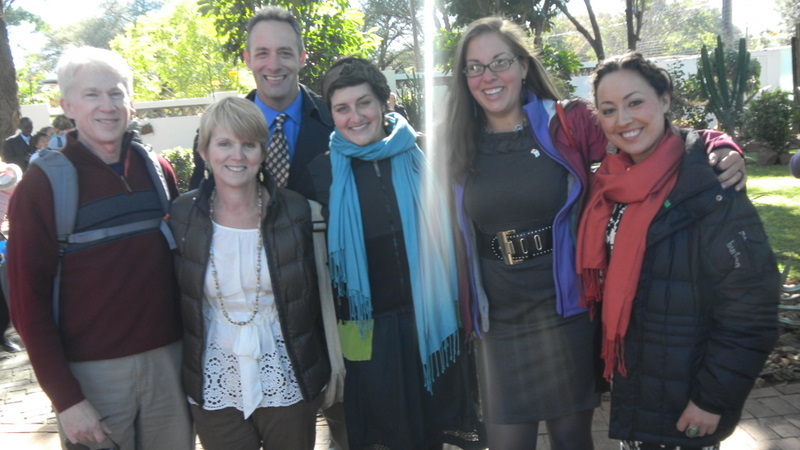 There were a lot we did know… the Peace Corps volunteers. 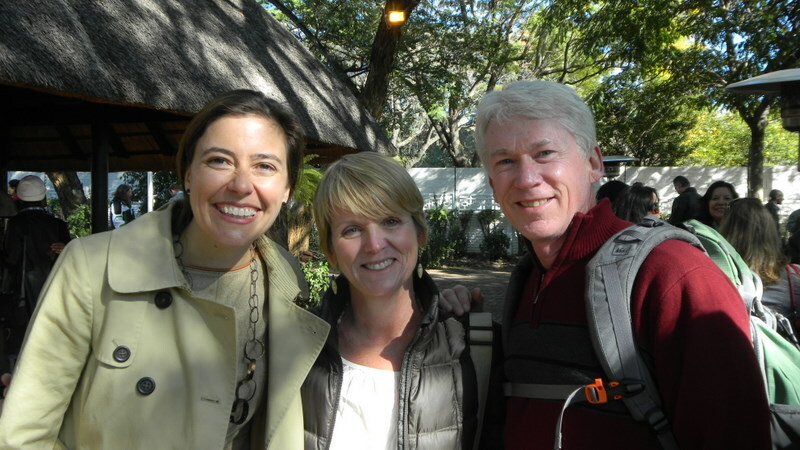 The acting director of Peace Corps Botswana, Heather Robinson, was allowed to invite 50 volunteers. 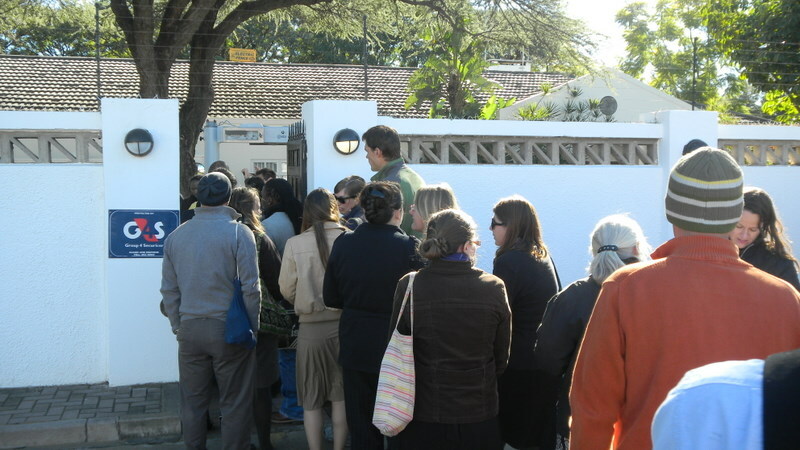 She invited the Bots 9 volunteers that were already in Gabs for mid-service training, and she invited any other volunteers who were living close enough to make the trip work. 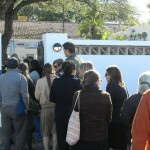 So we got to see a large number of our Bots 10 Peace Corps family, plus some Bots 9 volunteers that we knew. We also got to meet some volunteers that we had not had a chance to meet yet. During Pre-Service training a strong bond is formed between the volunteers, and they become like family. We had parted company at the conclusion of pre-service training only three weeks ago, but it was a long three weeks. This felt like a family reunion. We were very happy to see a lot of them at this event. We caught up on how they were settling in, the latest gossip, and also were sorry to hear about three volunteers who had ET’d (early terminated). The only other married couple had called it quits and decided to go home, and a young single girl volunteer who had been involved in an automobile accident was uninjured but shaken enough to want to be home with family. We chatted while we stood around in the garden and drank tea or coffee. Ambassador Gavin came out, walked around, and mingled with the crowd. She is young to be as accomplished as she is. I had read about her in the local paper. Her resume is impressive and includes a Masters from Oxford University where she was a Rhodes Scholar, a BA from Georgetown University’s School of Foreign Service, and experience working in the White House and on the National Security staff. She was friendly and we had a chance to talk with her for a few minutes and have our picture taken with her. A little later someone came out and told us what would happen when Michelle Obama came out, and gave us our instructions; where we were to stand during her speech, and where we were to stand when she came by for our meet and greet, and picture. Then she arrived. Ambassador Gavin ushered Mrs. Obama to the microphone and introduced her. The First Lady’s comments were short but sweet. 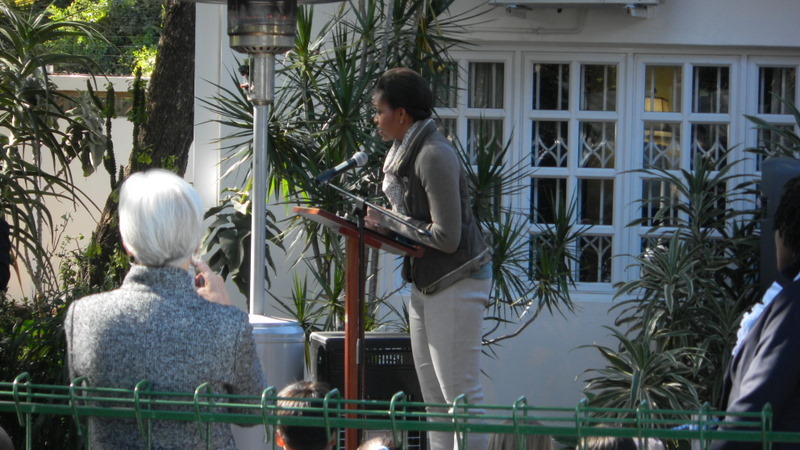 She talked about the strong friendship between the US and Botswana, and she acknowledged the hard work and dedication of the embassy staff and families. Then she acknowledged the Peace Corps and the work they did in Botswana. 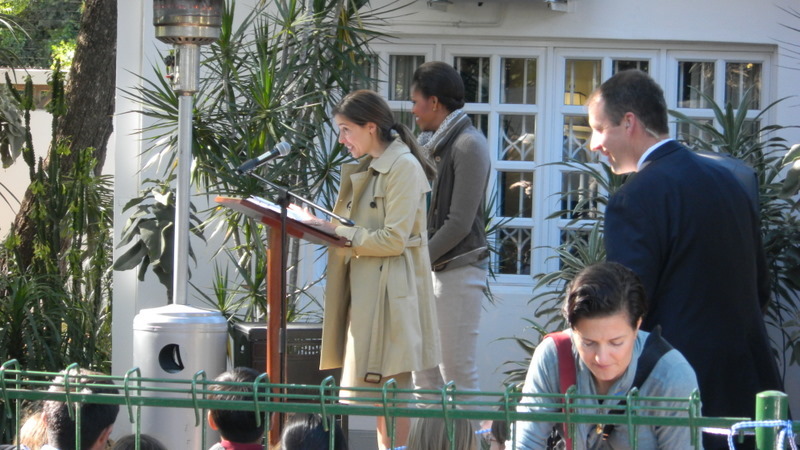 Finally she left the podium and began shaking hands and talking to the embassy staff. 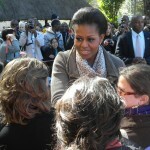 Then our turn came and she made her way to the Peace Corps volunteers. We had moved into our pre-arranged position for the photo. As she approached I noticed that she is really tall, and attractive. 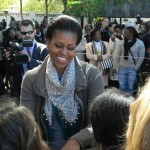 The smiling First Lady came right up to her spot right among our crowd on the front row and the cameras started to flash. 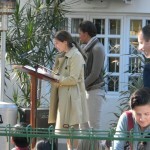 Then when the photo op was over she stepped out in front of us and faced us and said a few more words to us. Among other things, she mentioned that her 18 year old nephew who was traveling with them was considering joining the Peace Corps. Friendly, smiling, she continued talking with us as she was shaking our hands. I was about two rows back, but reached my hand out and she saw me and reached out and shook my hand. That was so cool. I have to be honest with you, I didn’t even vote for her husband. But for some reason, it really meant lot to me that I got to meet her and shake her hand. Then she was gone, and we all talked about her and continued visiting until we were told that it was time to leave. We quickly made lunch plans and set off for a nearby place called Fresh Café. 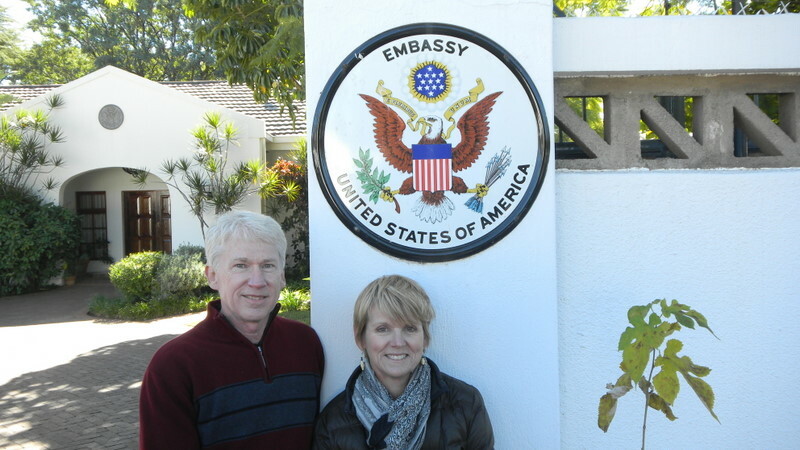 We had visited with our Peace Corps family, met the US Ambassador, met the First Lady of the United States, and had chocolate cake and lemon meringue pie. It was an awesome day. 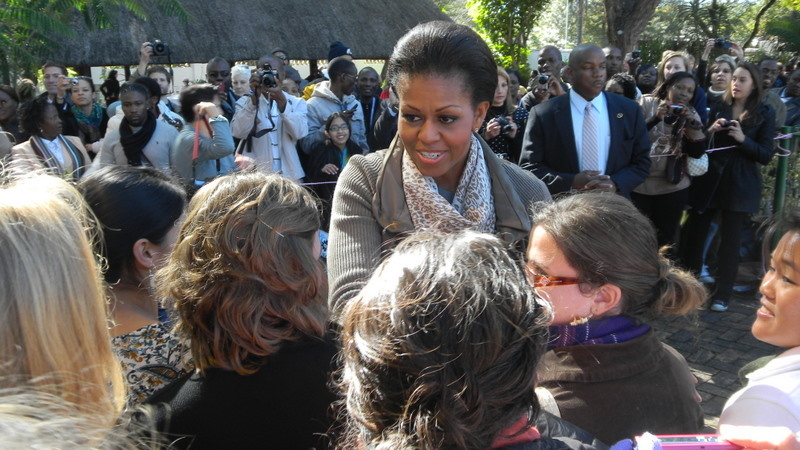 This entry was posted in Peace Corps, Service - Year 1 and tagged Botswana, Michelle Obama, Mobley, Peace Corps. Bookmark the permalink. Best lemon meringue pie ever? I find that hard to believe! I think it has just been awhile. Or maybe it was, did they use real lemons and natural/fresh ingredients?